The commissions have been done as business logos, signs, team t-shirts, promotional material such as stickers, as prints and for use as gifts. Only some of our work is shown here. This shows the process of how to get an original logo or illustration done to your requirements. We will create cartoons and caricatures from photos. We also do Business Cards, Artwork for Signs, Kids illustrations, and your standard Graphic Design work. Know a thing or two about HTML as well! "He is thrilled, I am sure he will be back for many years to come, thank you so much." "Great job. Obviously I went to the right guy this time." 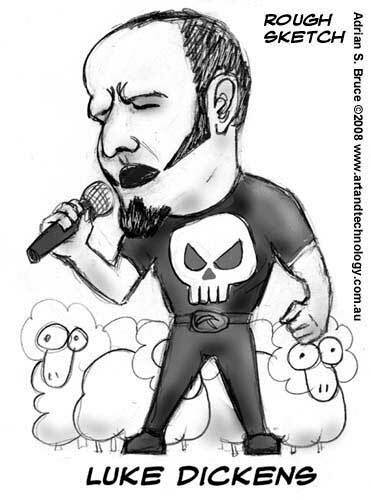 Contact Us about custom designs or licensing of illustrations. Wedding Caricature Cartoon repoduced on printed canvas with frame 16" x 24". Devloped from provided photographs. 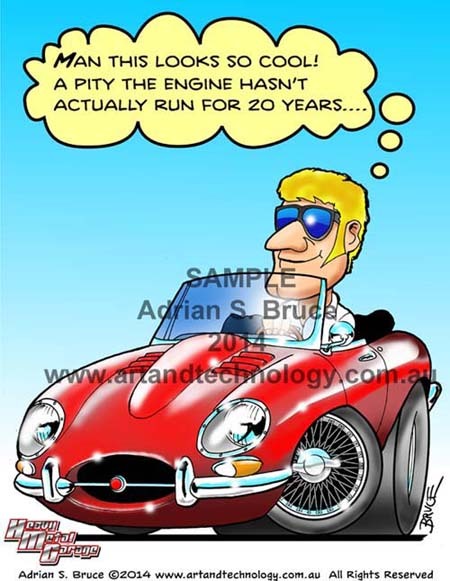 Caricatured car and driver. A very typical Topgear moment. 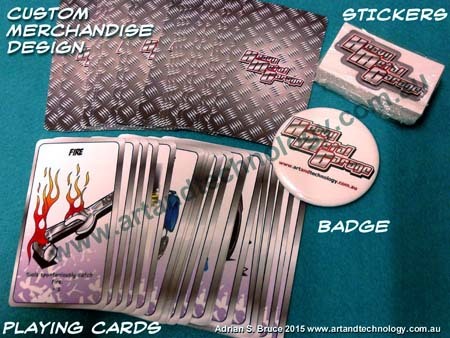 Merchandise Design showing cartooned logos with Stickers, Badges and Playing Cards. 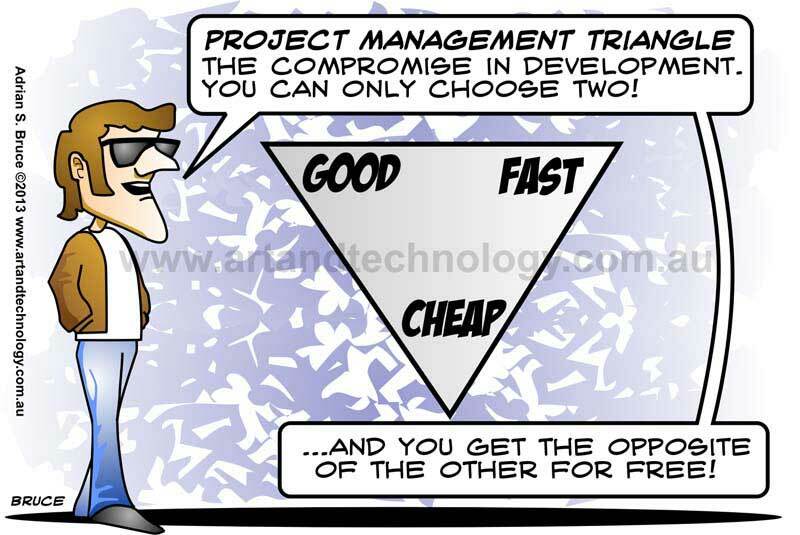 The Project Management Triangle - Good, Fast, Cheap. 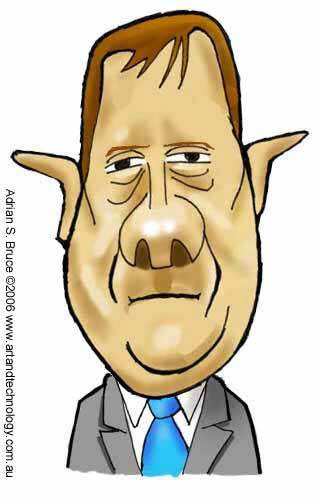 The compromise you have to develop and deliver something combining cost, quality and delivery time. This is a vector design so it is a size independent pdf. 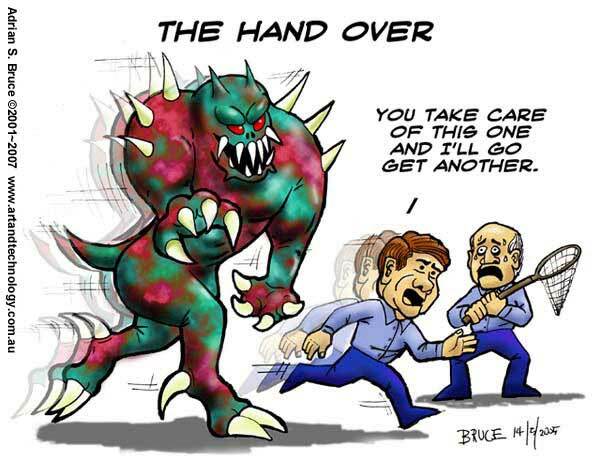 What goes without saying, is that if you also are not paying for project management, you have NO control over which 2, and it most likely changes randomly on a daily basis till the time or money runs out! The PM Triangle Coffee Mug and The PM Triangle TShirt are available at our online store. 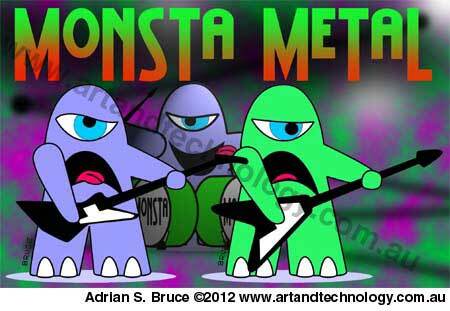 Cute Monster Metal. Some variations of the characters from our Online Store. Guitarists and a drummer. A Designer Cute Monster that just shows what metal is all about. Done as a vector illustration, then the final composited in Photoshop. Cute Monster Some Days are Peachy, Some Days Aren't Peachy. Some variations of the characters from our Online Store. 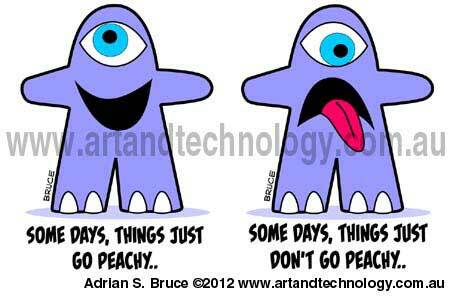 A Designer Cute Monster that just shows we are all human, at least sometimes. Done as a vector illustration. 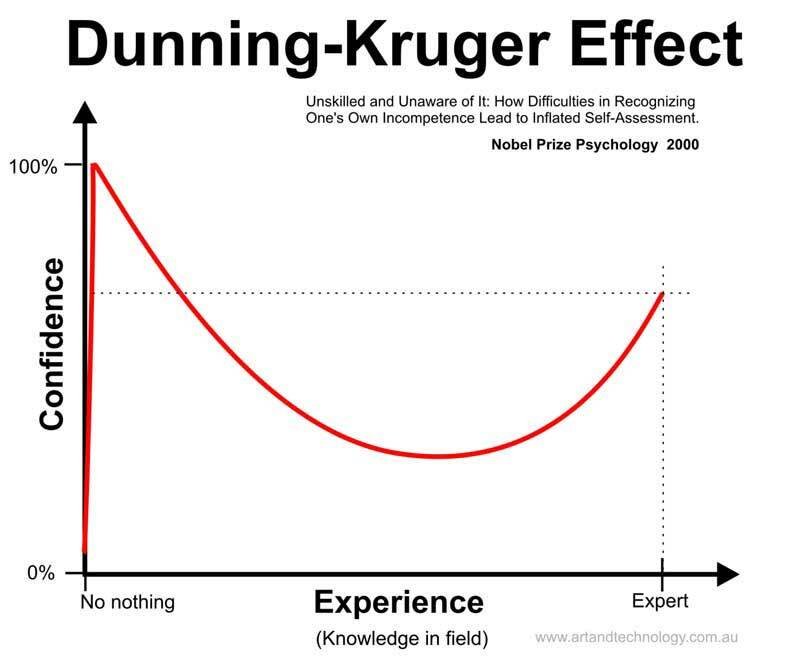 The Dunning-Kruger Effect is not a joke. This team won the Nobel Prize for Psychology in 2000 for proving that the unskilled in a field do not know what they don't know. No one is ever as confident as someone who doesn't know what they are talking about. This could be the guy in the crowd who thinks he could take out the prize fighter in the ring. It is also that "how hard could it be?" affect. To make this into a joke , print out and mark the red peak with something like "AM Radio Shock Jocks", "Politicians", "Companies with un-proven or obvious technology patents", or any other point you want to make! 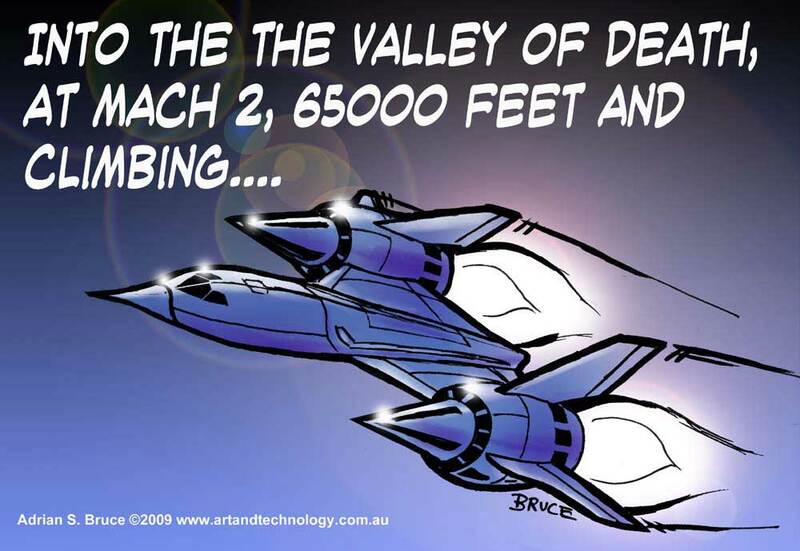 Here is a very quick, but colored, SR-71 Blackbird caricature and slogan. The way you want to go into battle, even at the office. Untouchably fast and high! 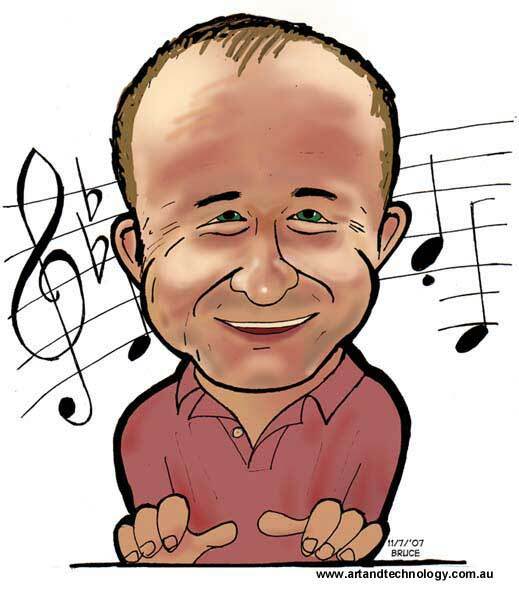 A cartoon of Dave Halls, a Sydney Jazz pianist / composer. A single panel cartoon, inspired by Ron Cobb's political style, and something many have personally experienced. What side would you prefer to be on? 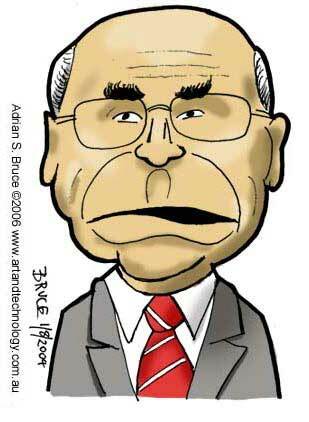 The Treasurer and best mate of the PM, John Howard ..... while he hasn't got the numbers to win, anyway..
Taxman, you can't take the sky from me is a bit obscure, but comes from the trying to work 'Firefly', into the Tax Department, and leaveraging off the 'flesh eating sub humans' Reavers description .... And a Hires version (300dpi 416Kb) is here. 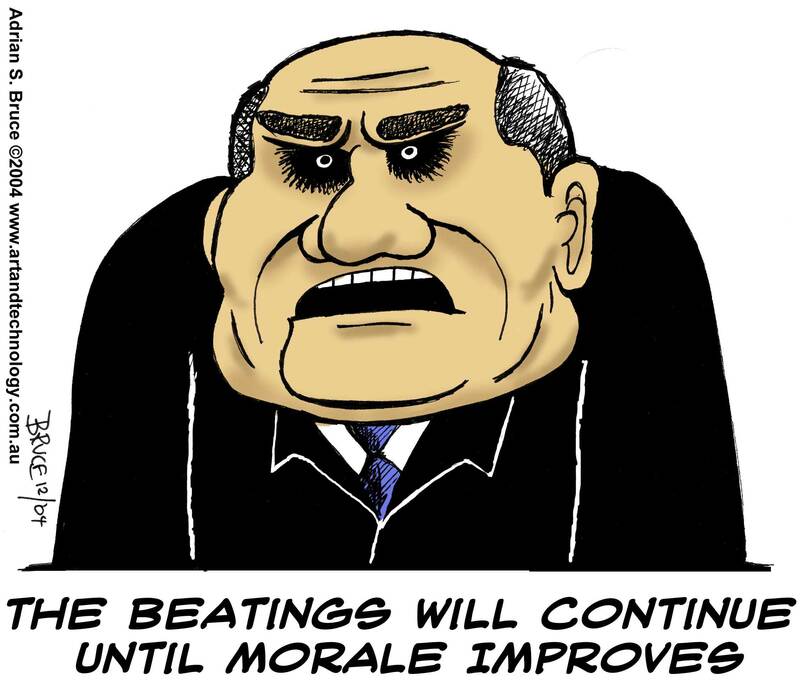 The encouragement to increase morale where you are? I heard it from a guy from the Railways... and get the Tee Shirt Here! 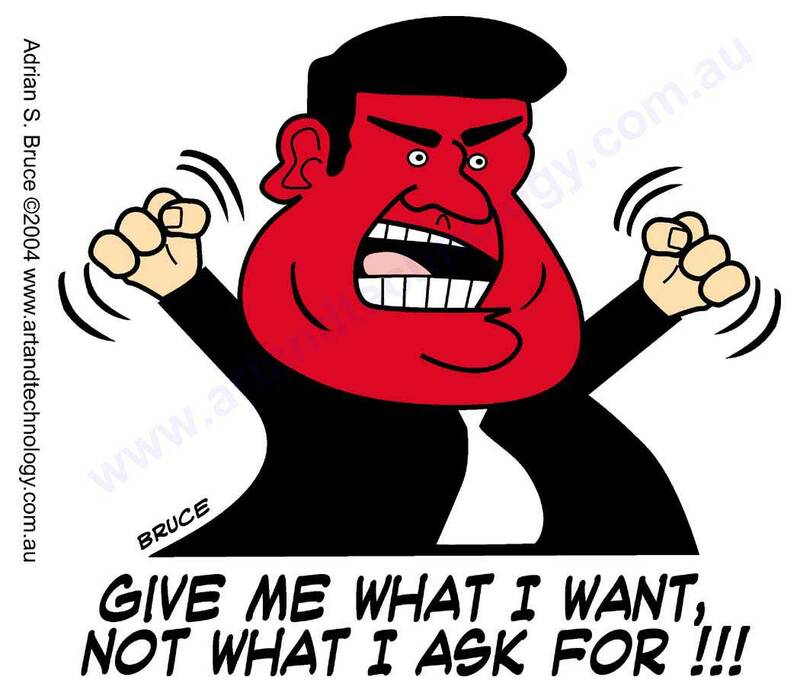 Give Me What I Want, NOT What I Ask For! 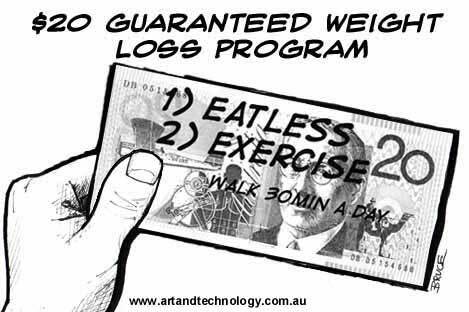 Follow this plan, and you will loose weight, and keep it off, without fail. 2001 is an amazing cinematic achievement, and on the other hand, rather dull for a lot of it. What Jerremy Clarkson might say? 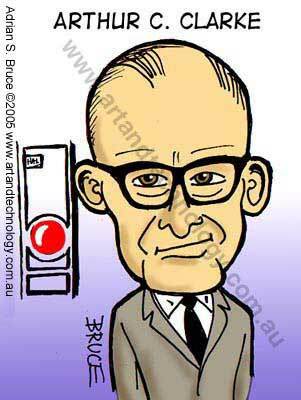 The face of Australian Innovation in the late '70s. 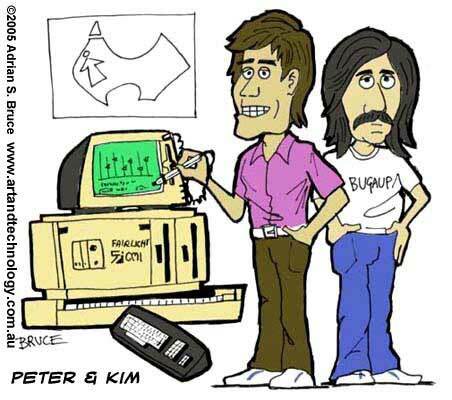 Peter Vogel and Kim Ryrie with their world beating company and Fairlight CMI. Impressive, aren't they? I have worked for them ... and it was the best place I've had the opportunity to work at so far. 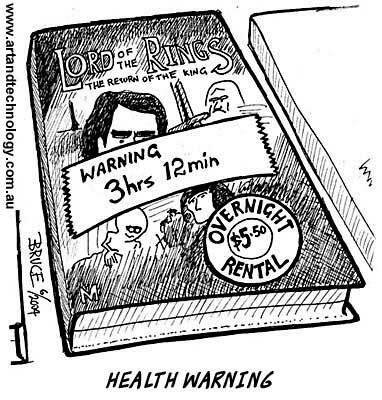 A single panel cartoon, Health Warning at the video rental store. A true story. The new SBS TV "The Movie Show". 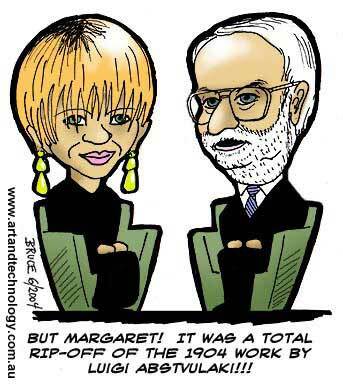 After over a decade, David and Margaret changed broadcaster. Here is the new young movie show, in young styles, young colors, young hair and the must have motion graphic jumping titles to show they are young. The changes they made were good. 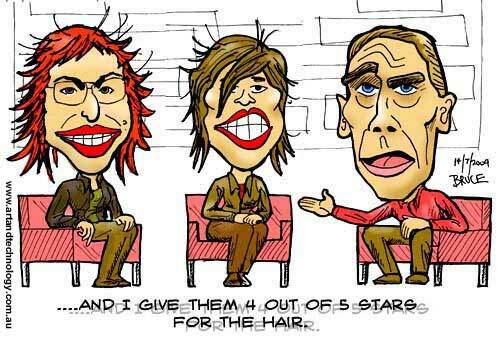 A pity the show finished the first week of June 2006. 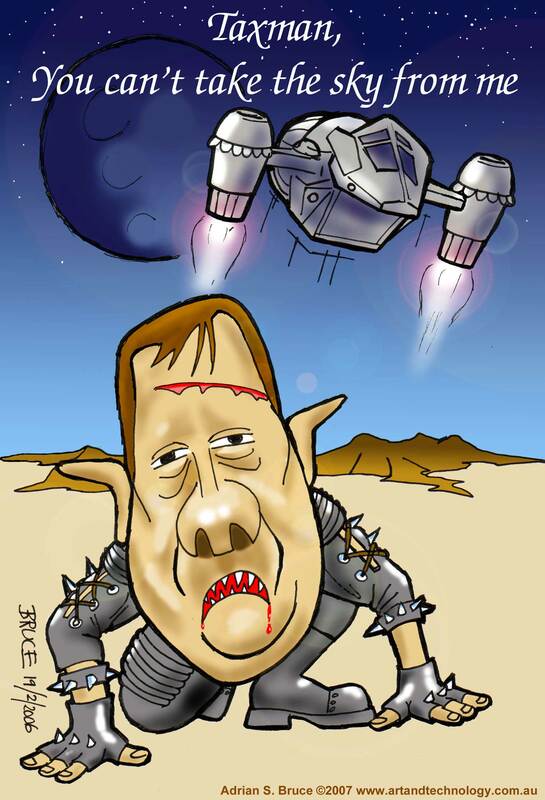 It is the end of the world as we know it.... the result of more outsourcing. 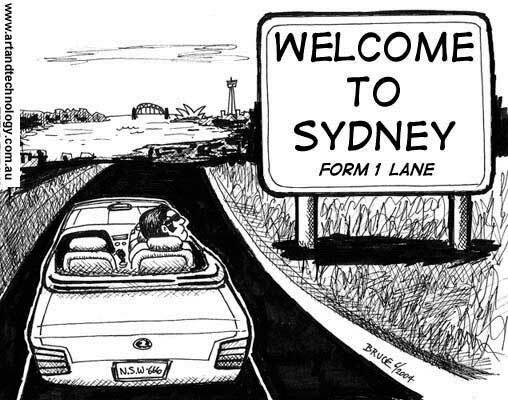 Welcome To Sydney, the lane you are in may terminate, become right only, merge left, merge right, or turn left only with as little warning as we can manage. A beautiful place that is easier to get around in once you know the road traps. 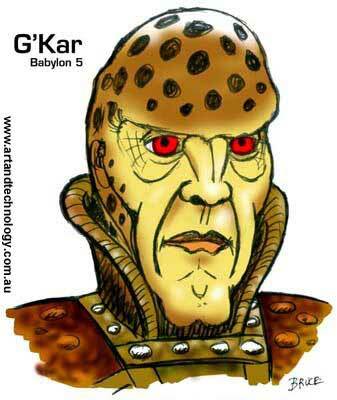 A caricature of G'kar from Babylon 5. 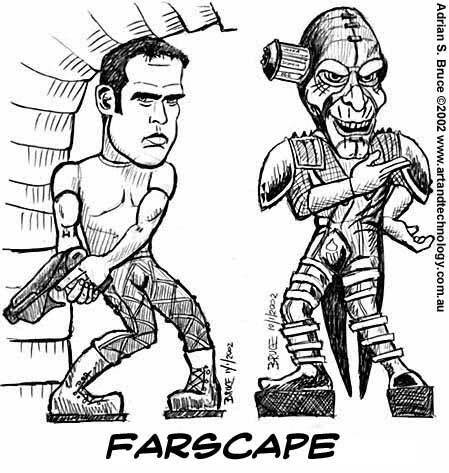 Black pen Farscape characters. The one on the left being in the last of Stargate SG1 as well. Here he is about to do more running around that same corridor set. The pretty model on the right is of course pointing out where this website is. 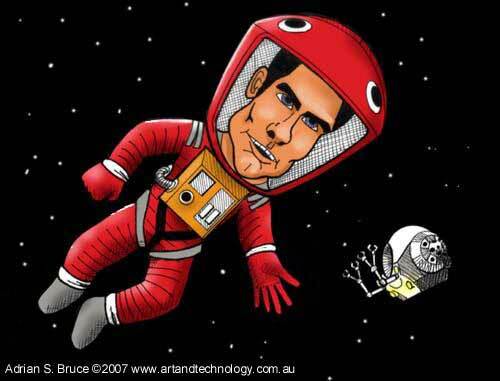 Farscape was filmed in Sydney. 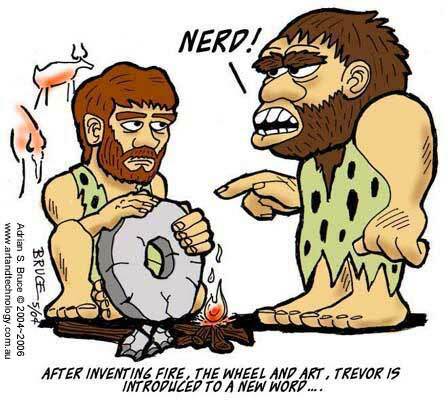 Copyright © 1995-2015 Art & Technology. All rights reserved. Sydney Australia.